Finally the two leading Republicans House Speaker Paul Ryan and Senate Majority Leader Mitch McConnell have distanced themselves from the rude Trump’s attack on the wife of a war-hero and honored the Khan family. Read all about Trump’s Khan-gate here. But now, the lower hits the low. Longtime Trump advisor and friend Roger Stone took the Khizr Khan drama to the next level. He claimed in a tweet (below) that Khizr Khan, the father of a fallen soldier who spoke at the Democratic National Convention, is a ” Muslim Brotherhood agent helping Hillary”. They also claim that since Khan runs a law firm in New York that specializes in immigration services, he must be working to bring Muslims into the country. Conspiracy in the GOP is based on a swamp of crazy ideas like the moon-landing was fake or 9/11 done by the government and so on. Always a mix of some facts and absurd conclusions. Whoever is pro-Clinton and Muslim is under attack since several years by a group of radicals who know no moral limits and have no proofs. It is a poison-tea-party. First victim was president Obama, whom they think is a Muslim and born in Kenya. This was promoted by obscure Frank Gaffney, whom GOP hopeful Ted Cruz had hired as his advisor. Second was beautiful and smart Huma Abedin, top-aid to Hillary Clinton. They say, she is Muslim Brotherhood too. Third now is the Khan family, who fought for the values of the United States. And lost their son in the fight against radicals. Why don’t they tell us next Pope Francis is a Muslim Brotherhood agent, as he speaks in favor of Islam? Or he is a hidden Imam in the Vatican? Why is Trump not a Nazi, as his genes are German and his grandfather emigrated from Germany- maybe to build-up a Third Reich in the US? The bad thing is: many, too many Republicans believe in it, want to believe. They need and love a simple world of black and white and we are always right and the others wrong and very dangerous too. They follow a narrow-minded GOP repudiate ideology. Thus isolate from the real world and truth. All this violates the moral and soul of the United States of America and its constitution which is protecting the rights of people with other faith and ethnic background. The US is based on emigrants, who fled such hate-mongers in Europe, including the Nazis. Who is Trump’s friend and advisor Roger Stone? He is too conservative even for the Republican party, so he’s become a Libertarian. Stone has also been a business partner of Trump’s current campaign manager for over 30 years, and he also used to work for Trump’s campaign until August of last year. Apparently, he’s been Trump’s main political advisor for many years, though he has no formal tie to the campaign now. 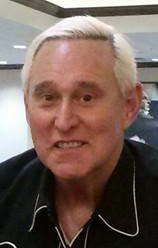 Most importantly, Roger Stone is a loose cannon trying to stir up drama and conspiracy to help his friend Trump. He is missing the American respect for the family of a fallen soldier or for the American ideal of tolerance and respect for people with other religion and ethnic background.